This report is from a one week assignment from my Masters course. Question: Read Ross et al. and replicate their analysis. Their datasets are available online. Note that due to time constraints the analysis was performed in a truncated version of the original dataset. The aim of this experiment is to identify pediatric AML subtypes based on gene expression profiles of leukemic blasts. Sub type identification can facilitate the development of personalized treatment options, specific to the gene expression profile. This could by extension, improve the statistics of AML patients cure. In order to classify samples in distinctive subtypes (classes), oligonucleotide microarrays were utilized to analyze the expression of more than 22,000 genes in diagnostic leukemic blasts from 84 pediatric AML patients; The data was divided randomly into two set, training set (with 62 samples) and test set (with 21 samples). 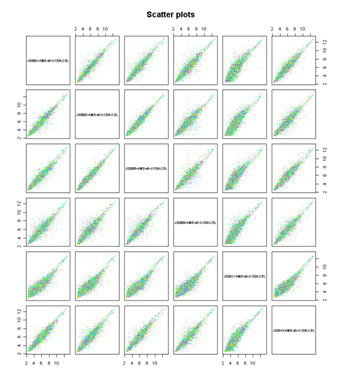 Train data was used to model a support vector machine (SVM) that is used to classify the samples into specific subtype class, and the test data was used to validate this SVM. To Assess data quality at ‘probe level’. 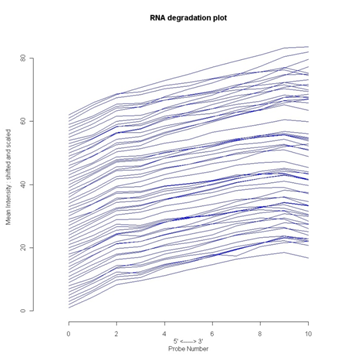 The plots clearly shows that it requied pre-processing. 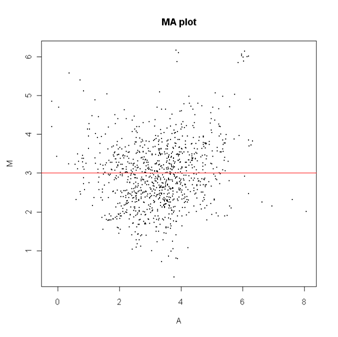 The plots shows the dataset has improved vastly. Nonetheless, there seems to be a little degree of factuality between the samples, hence, deducing that filtering would be required. The variance across the probes was analysed and top 1000 potential genes were selected. 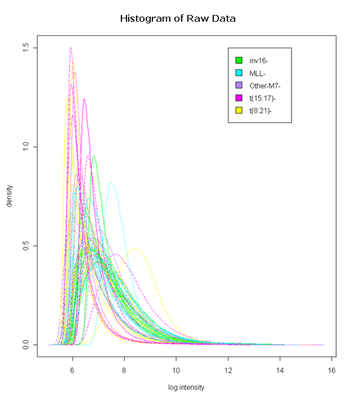 #assess the variance of a probe set across all samples. 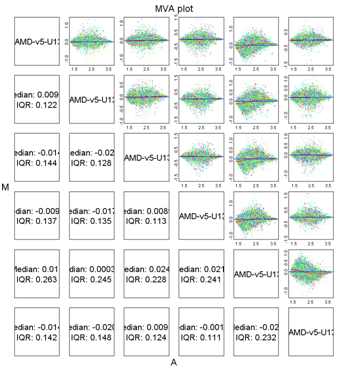 The genes selected after filtering were analysed using unsupervised 2-dimensional hierarchical clustering algorithm (HCA) to assess the major grouping of the subtypes based exclusively on their gene expression profiles. 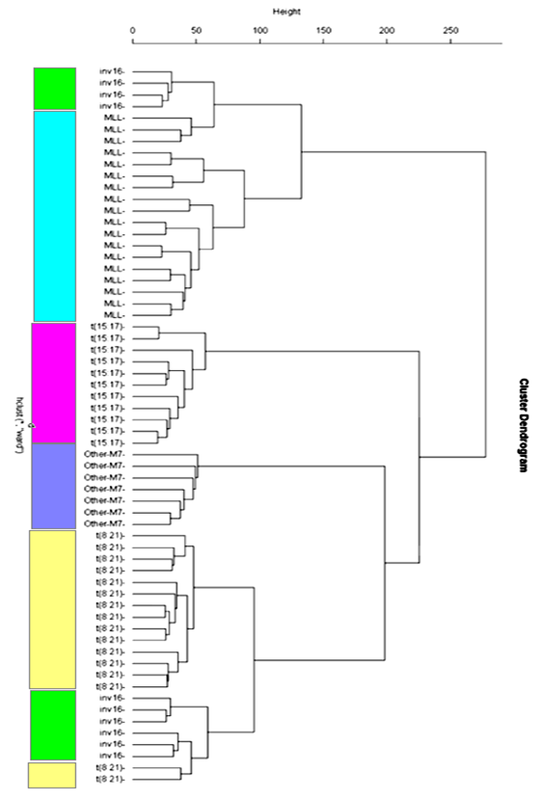 The clusters identified most of the major subgroups. 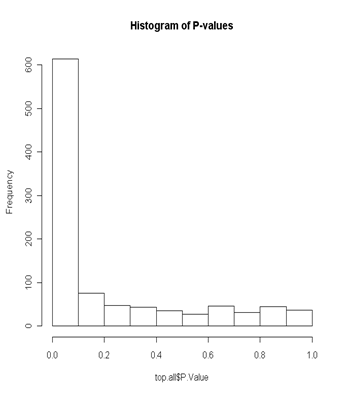 #pca <- prcomp(A, scale=T) # Performs principal component analysis after scaling the data. #summary(pca) # Prints variance summary for all principal components. #library(scatterplot3d) # Loads 3D library. 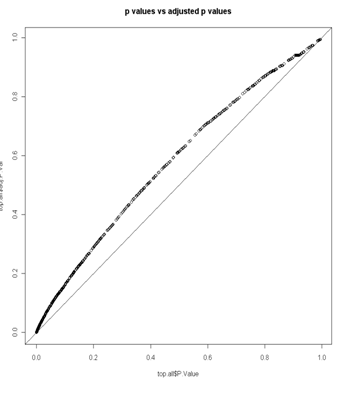 a linear model was fit to the data set. A contrast matrix was generated by venturing the contrasts of difference between the subtypes. The contrast matrix was fit to the linear model which was used to compute moderate t-statistics using Bayesian model, ebayes. 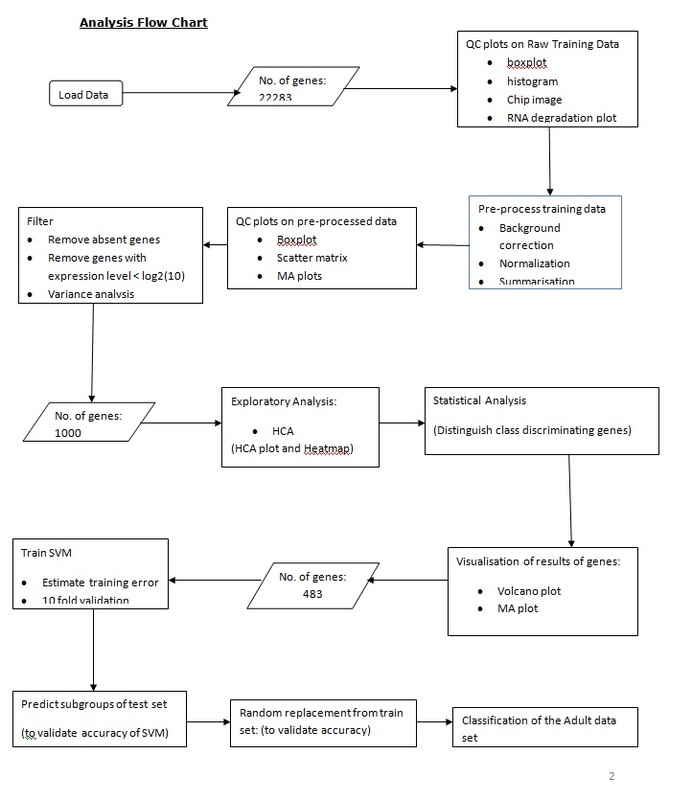 The ebayes analysis is analogous to the standard single-sample t-test with the exception of making use of information between genes. 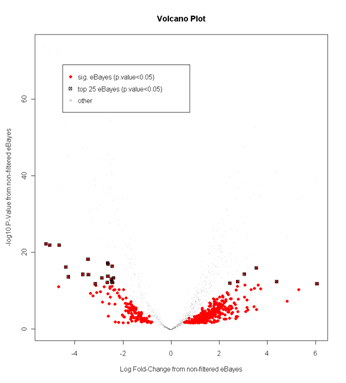 the genes with adjusted p-values less than 0.05 were selected, 483 altogether, were used for classification. # create contrasts (group comparisons) of interest, in this case 10 comp. 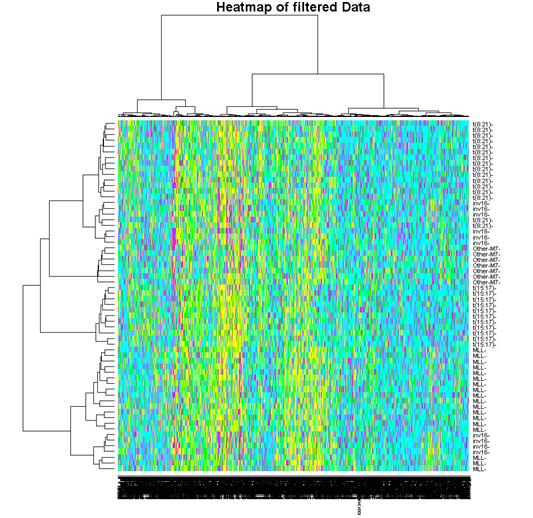 SVM models are a popular classification method for highly multivariate data like this. The SVM was trained using type ‘C-SVM’ and a linear kernel as function settings. Once the SVM was trained, the number of samples misclassified was tested on the training set; result was zero misclassification. The performance of SVM was also accessed by 10 fold cross validation on the training set; result was 100% accuracy for all the subtype. #train a support vector machine. #Check if the model is able to classify your *training* data. The SVM was then used on the test data set which would determine the true accuracy of the classification; result was zero misclassification. This provides validation that that the SVM has a high extent of accuracy for classification of samples into its respective subtypes. Step 8: Random replacement of classes from train set A test was tried by randomly replacing the labels on the training set and redoing the SVM classification on the missed up samples. The result gave a very low accuracy, usually less than 40%. The dataset with adult samples came with 5 additional pediatric cases of T-ALL with MLL translocations, hence that dataset 25 sample altogether. 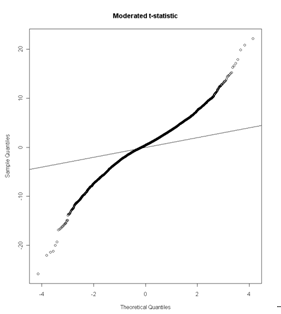 10 Fold validation gave a total percentage accuracy of 88%. These results are slightly different from that from the paper, it could probably be because different techniques were utilized by the paper, such as SAM and ANN instead of ebayes and SVM. Secondly, instead of the original datasets, we used a truncated version due to time constraints. Extremely informative blog. Please let me know where could I find the data, train_set.txt, used for this analysis. This report is from a one week assignment from my Masters course, where were we required to read Ross et al. and replicate their analysis using the datasets available online. Good post. Is there any detailed literature for these kinds of analysis for those who wish to get started ?